Our product range includes a wide range of hydro machine. We provide Oil Extractor Machine. Centrifugal dryer used to remove excess oil/water from namkeens & sliced potato water. 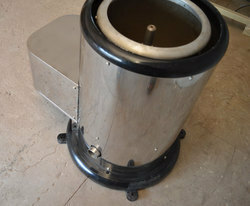 It has a rotating basket in which the product which has to be dried is placed, after a spin for few minutes the product is dried, only the surface water is removed from this machine products is not fully dried, available in stainless steel as well as mild steel model. Looking for Oil Extractor Machine ?